Naming perfumes is no easy feat. And in the case of KOMOREBI I invited you to the brainstorm with me not only for finding an evocative name for my creation, but also attempt to coin a word that will describe the olfactory phenomenon that inspired the perfume. I've contacted talented fragrance writer and fellow perfume lover Elena Vosnaki of Perfume Shrine to collaborate with me on coining a new word for describing the phenomenon that Komorebi was inspired by. Elena's knowledge of the Greek language was paramount to this process, and I've learned much from the process - similarities to other languages, myths and lore that encompass the entire globe, well beyond the Greek archipelago. The idea behind this ambitious act of smell-naming was to give fellow perfume lovers and writers another word for the scent that is as recognizable as petrichor - and I can only hope it will gain traction and be used well beyond the ad copy for my perfume. There are so few words unique to the realm of scent. Komorebi is the first in a series of four perfumes dedicated to special places in the Pacific Northwest. 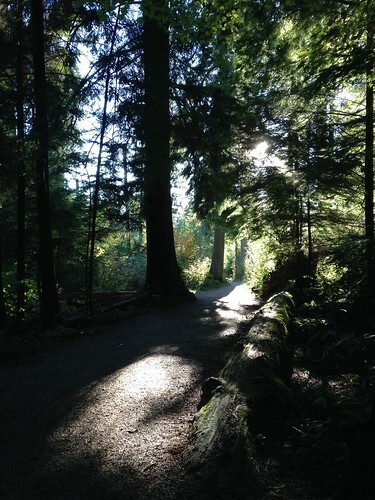 Place of inspiration: Cathedral trail in Xwayxway (Stanley Park), which is pictured above.